The God of Moses was different from the gods of other tribes, and expected the people following the real God to be different from the people who worshiped pagan gods. This passage gives an adjective to those differences, "holy," then it specifies a few ways in which God's people should differ from other peoples. Saint Paul tells the church in Corinth that it is holy, and that it is most unwise to let itself be split by loyalties to certain leaders or ideas. Jesus, the new Moses preaching from the mount, continues to contrast the ways of his followers with the accepted ways of earlier peoples. The Historical Background: Not all parts of the book share the sublime origin described above. Much of it is petty. Much of it reflects magical thinking and materialistic religion. Much of it is meant to enhance the job-security and comfort of priests. The bringing together of its parts, their editing and rearrangement, always served the needs of some, and sometimes served the needs of all, of God's people in particular places and times. But the genius of the underlying notion of holiness, both of God and of the people, stands. The Liturgical Setting: The holiness-as-contrast motif makes this reading appropriate for proclamation today in view of the gospel. We've come to the point in the Sermon on the Mount where Jesus strongly differentiates the ethical behavior that he expects of his disciples from the conventional, from what we "have heard that it was said." Maybe it was understood that "it was said" meant "said in the Law of Moses or said by my predecessors." But maybe Jesus gives no attribution because he's dismissive of the tired old wisdom. Proclaiming It: Think about how you'd like to hear a reader announce today's gospel, where Jesus distinguishes his new commands from what "you have heard," the dull, unchallenging, old-fashioned, obsolete ways of doing things. The Sermon on the Mount was not the first time God had announced new expectations and expressed disdain for old ways. This passage from Leviticus recalls an earlier, similar revolution. Make it sound revolutionary. Make the Lord sound authoritative, for that solemn authority is all God has to use to be persuasive. Were you moved by the idea that we're called to holiness because God wants to be with us? If so, re-read the first three paragraphs, above, and feel that passion again, right before the liturgical service where you'll call God's people to holiness again. The Historical Background: We're still in Corinth, and Corinth is still unruly, and Paul is still trying to unify the Corinthian Christian community. In one sense, his desire to resolve their differences is motivated by a vision of their holiness, in this sense we discerned in today's first reading: Your community in Christ should be different from the fractious, competitive groups around you because your Head, Christ, is holy, is different from whatever inspires those other rivalries. Let's not be like them. To be so is to be unworthy of Christ. More immediately, Paul has been using imagery from the house-building trade. He says in verse 3:10 that he had laid the foundation, and others must respect that foundation, which is Christ. But they build upon the foundation with gold, silver, jewels, wood, hay or straw. That sounds descriptive of a variety of contributions to church community life. And under Paul's fertile pen it branches into another building-based metaphor, that the people are a temple. We late Christians are long used to hearing that we're temples of the Holy Spirit, but in the old days, a temple was a unique reserve for a special presence of a deity. In the Jerusalem temple of the Jews (the only temple of the Jews by now, anywhere), there was an inner sanctum which only one high priest could enter, and only once a year. Now Paul is telling a boisterous community in a pagan seaport that they're a temple in whom lives the Spirit of God. So this sentence of the reading is more revolutionary than you might think. Then Paul changes the subject back to an earlier one, and gives us some more on the differences between human powers and God's powers. He wants factions loyal to different Christian leaders in the history of the Corinth community to transfer those loyalties to the one Christ, so he minimizes the powers and authority of Cephas, Apollos and himself. In Your Proclamation, think of the reading as three paragraphs (it's laid out that way in the lectionary, although Saint Paul probably didn't lay it out that way on his vellum; we'll never know). The first paragraph has two sentences. At the end of the second sentence, emphasize the last clause, "for the temple of God, which you are, is holy." Pause after saying that. I recommend this in the hope that your hearers will connect this "you are holy" statement with the first reading. In the second paragraph make audible all the contrasts between wise and fools, wisdom and foolishness. Vary your tone of voice as you speak these words. Make Paul sound seriously concerned—his people were acting foolish, at their peril, and he earnestly wanted them to embrace wisdom. This was not trivial or routine. Give the third paragraph the rhetorical flourish that its author clearly intended. Sound triumphal and conclusive. 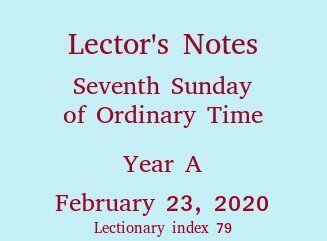 The list above is short because the church has observed the Seventh Sunday of Ordinary Time or Seventh Sunday after Epiphany only twice since 1996. Why is that? Well it's complicated, but comprehensible. The span of weeks in the church calendar between Ash Wednesday and Pentecost is always the same length, but can start anywhere in a thirty-day stretch of late winter. The period of Advent-to-Epiphany pivots around the fixed date of Christmas, but can vary in length by six days, can start within a week-long span in late autumn, and can end on any of seven dates in January. The Seventh Sunday of Ordinary Time has to fall in one of the windows between those floating special seasons. But wait, it gets more complicated. By a most ancient custom, based on the pre-Christian scheduling of the Jewish Passover, Easter falls on the first Sunday after the first full moon after the spring equinox. Full moons occur every 29&half; days. The equinox can be within a day or two of March 21. March 21 occurs every 365¼ days. So the date of Easter slides back and forth in the calendar. Likewise the Lent-to-Pentecost season. So the number of weeks of Ordinary Time between Epiphany and Lent varies from year to year. The interval of Ordinary Time between Pentecost and the following Advent can also vary. Why? Because we want four Sundays of Advent before Christmas, and Christmas moves in the calendar from a Monday to a Sunday. So Advent might begin as late as December 3, or as early as November 27. That can shake up the number of Sundays between Pentecost and Advent. One of the Sundays in that stretch might be designated Seventh Sunday of Ordinary Time. But frequently the two elastic periods for Ordinary Time don't add up to the optimum number of ordinary Sundays. If we have to squeeze some out, we let go of Ordinary Time Six, Seven or Eight. It's kind of arbitrary, but it's based on some traditions that we've found comfortable. Do a little arithmetic on the number days in a week, in a lunar month and in a year. The intervals don't divide into each other evenly. The natural phenomena that reflect these intervals, because they reflect positions of earth, moon and sun, are the tides. A sailor I know once told me that tide tables repeat themselves every nineteen and a half years (I don't know why that's not a whole number). Or maybe it was an astronomer who told me their ephemerides, their tables of the times and azimuth of moonrise and sunrise, have a period of 19&half; years. I don't remember. Some figure like that may describe the cycle of liturgical cycles. Throw in the fact that our readings vary over a three-year cycle. That explains why you haven't heard today's readings in church for several years, Q.E.D., and why the still young Internet contains so few old essays about them. 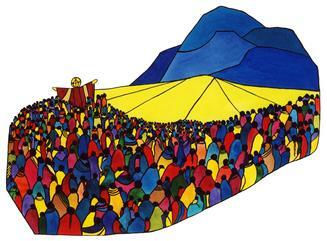 A painting of Jesus' Sermon on the Mount, by Gisele Bauche of Saskatoon, Saskatchewan, Canada; used with the artist's permission. Click here for her website. Then, to see more of her work, click Gallery .